Jonathan Iyandemye is but one of our success stories highlighting the power of entrepreneurship in changing the lives of individuals and their communities. Jonathan was a student at the first “Academy” program that Dennis Hanno ran in Rwanda in 2011. The Academies were one week workshops run in 4 Sub-Saharan African countries where Entrepreneurship and Leadership skills were taught to high school students. There students learned how to move from ideas to action. They learned about generating ideas and networks, branding and the 5 Ps of marketing, feasibility analysis and supply chains as well as the mechanics of accounting, and the basics of cash flow, and start-up costs. The intensive Academy week culminated in a rocket pitch competition. In 2011 Jonathan won the competition with his idea for a computer training business. It is not only the idea that is being assessed in these competitions, but the presentation itself that ends with an Ask for either funding or support of another kind. Jonathan worked for months after the Academy was over to refine his business plan and eventually received three hundred dollars in seed money from the Academy program to start his venture that he hoped would enable him to pay for his own high school fees each year and alleviate the financial pressure on his family. Jonathan used the knowledge he had gained from using his brother’s computer to think about helping others to gain computer skills. With that same computer he set up a classroom in his parents’ dining room. Getting his first students was a struggle, but he eventually got two students and worked hard to prove his worth. By the end of two months he had ten students and had to hire his sister to help with teaching classes. “I figured out that for me to achieve the big dream of owning my own company, I had to start small and use what I already had on the table,” he said, admitting that the early days were tough and scary. Eventually he outgrew the room in his parents’ house and rented a small house to teach his classes. He hung a sign outside the door and opened a bank account where his students could pay their tuition directly. At that point, he employed both of his sisters in the growing business. Jonathan learned to recognize opportunities in his own community and worked to fill that need. His business evolved over the years as he learned to recognize changes in the market and tailored his business accordingly. Jonathan became a Bridge2Rwanda student. 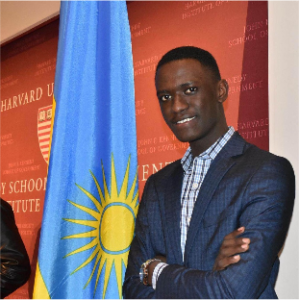 The Bridge2Rwanda Scholars Program is a gap year program that helps the best-performing Rwandan students win scholarships in top tertiary institutions in the US, Canada and Europe. Today Jonathan is a Harvard University student with a full scholarship for four years.